Prolonged High Pressure has us enjoying the beautiful unseasonably warm weather. Although the snowpack could have surface Loose Wet instabilities the residing pack below is mostly stable with some anolomalies. Avalanche activity is fairly subdude & observations of Faceted grains having rounded can help increase stability. Use caution in the morning as icy slopes will be apparent. In contrast afternoon sunny slopes could be prone to Loose Wet snow grains that could avalanche small. Uninhibited sun & above average temperatures are degrading the surface snow conditions in the afternoon. 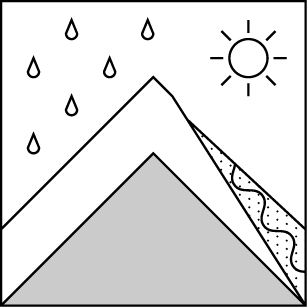 For early risers of the BWRA expect supportably icy surface snow with moist grains below. The angle of the suns progression on aspects will melt easterly slopes first with west melting out later. Rock & vegetative outcrops will have wet snow surrounding them if sun exposed, & are places where Loose Wet avalanches could originate. Small in size these avalanches could push a traveler into places they did not intend. Avoid late-day steep South aspects. Surface clues are going to help you stay safe today. Avoid icy slopes in the morning, & sunny slopes late in the day. Windpack & Melt-Freeze crusts make up most of the exposed surafce conditions. In generally protected areas, soft snow & surface hoar can be found up to 4mm in size. The warming of the snowpack has mid-layer Facets rounding & increasing in strength. Areas that see prolonged direct sun on Southerly slopes will be prime for afternoon avalanches. Observations from the BWRA & the surrounding mountains in the Humboldt-Toiyabe are seeing a similar snowpack structure. A concerning layer of rounding facets midway down the pack is the area of some concern, although test results are nil. As we gain ground throughout the mountains avalanches from last weekends mixed precipitation event are showing themselves. All the slides we've seen have involved the storm snow & its transport to lee aspects. Melt-Freeze Crusts cover the overall snow surface where direct sun has been exposed. Surface Hoar in shady & wind protected areas can be found to be 4mm in size. Todays sunny skies will become broken by partial clouding in the afternoon. Above average temperatures will continue for the rest of January. Ridgetops will have light winds from the Northeast with a moderate gust possible. Dry air with valley fog this morning. Temperatures: 42 to 50 deg. F. 24 to 32 deg. F. 50 to 58 deg. F.
Temperatures: 35 to 43 deg. F. 29 to 35 deg. F. 44 to 52 deg. F.